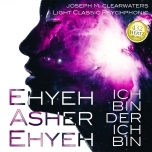 The healing sound music of Joseph M. Clearwater gildes body, mind and soul on a higher, non-material level and awakens the soul potential of wisdom on all levels - enlightenment and redemption. It strengthens the sense of indestructible values, promotes all spiritual developments, opens cosmic divine realms and creates an impenetrable golden "protective mantle". Gild body, mind and soul with the ethereal music, the "Divine Elixir", to levitate consciousness, to restore superconductivity and energy tuning of DNA. The mode of action of music is more frequented, primarily in the spiritual-emotional area. It is present in both worlds, so to speak, is light and matter at the same time and transforms the "lead" of the human spirit, the ego with its negative, dense structures into "gold", the divine soul. With this music the archetypal forces and information can be released much more far-reaching. Their specific powers of action support the consciousness of man, his emotional world, his world of thoughts and his spiritual parts of being. The effect on the energetic and physical body takes place as a side effect, so to speak. ► The aging process is to be reversed by the energetic repair of faulty DNA programs. It has a rejuvenating effect and prolongs the vital life of the DNA. ►Damaged cells or energetic dysfunctions should be regenerated (also of brain cells). ►The endocrine gland system would be energetically strongly activated. ►The light/photon flow in the nerve and meridian system should be permanently intensified and increased. ►The self-healing powers are to be significantly improved. For example, insomnia, restlessness, depression, and many other mental, emotional and physical problems. ►The superconductivity of the DNA would be upgraded and its energy flow increased. ►Intensive emotional cleansing and stabilization would be triggered. ►A significant increase in performance and stress resistance would come into effect. ►One rests more and more in oneself and is clearly more stable in one's midst. ►One recognizes ever more solution ways instead of problems, since one sees oneself in addition, the outside ever more clearly. ►The manifestation effect of thoughts would be strengthened. ►Intelligence expands to higher levels of the mind. ►The frequency of the chakras and aura bodies would be increased. ►Perception would be expanded and mental-spiritual abilities would be activated. ►The Kundalini energy would be harmoniously increased. ►The sleeping ("supernatural") potentials should awaken. 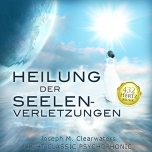 ►The uplifting qualities of Joseph M. Clearwater's music lead to an all-round increase in quality of life and consciousness on all levels (physical, emotional, mental, spiritual). Music can support us humans in the current time of change and the associated inner alchemistic processes and lead us to a good "end"! They would help us to actually reach and realize the long announced "New Aeon" of universal consciousness. The basic effect of the music of Joseph M. Clearwater is identical for every person. But the individual changes that music triggers subjectively are of course very different. Depending on how conscious someone already is, can surrender to the processes of consciousness, he can free himself from dense energies, transform them through meditation, mystery work and by how deeply he can surrender himself to the processes of consciousness. 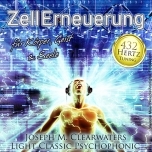 Musik-Apotheke.com has set itself the task of making Joseph M. Clearwater's music available to a broad public. The titles of the music pharmacy are offered as files in MP3 format 192 kbit/s, 44.1 KHz stereo. ► Our music is only allowed for private use - for commercial purposes please read here under licenses.